Well Eat the food the way its meant to be eaten but with forks its too dificult. Watching others using chopsticks can make it look so easy, but when you try it, you end up asking for a fork. Here's how to say goodbye to that fork for good and put those chopsticks to work! 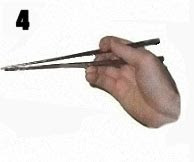 Pick up the first chopstick with the middle finger and thumb. 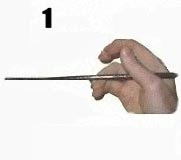 Grip the second chopstick with your index finger. 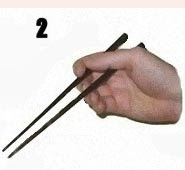 Place your thumb over the second chopstick. Adjust your grip to a more comfortable position. Make sure the narrow tips of the chopsticks are even with each other to help prevent them from crossing or being unable to "pinch" the food. Practice opening and closing the chopsticks. Make sure the broad ends of the chopsticks do not make an "X" as this will make it difficult to pick up food. Pick up food at a good angle (try roughly 45 degrees from the plate); slightly lift it up. If it feels unstable, put it down and try again. The difference between looking like a stupid American & looking like a refined cultured person is showed to Chinese people when you hold chopsticks. Do not hold the chopsticks close to the end. The farther away your hands are from the food, the better. Start out holding the chopsticks in the middle or closer to the tips while you get used to the movement and keeping the tips aligned. As you become more comfortable and confident, try holding the chopsticks closer to the broad ends. While it may seem easier at first to hold the chopsticks near their tips, holding them further back means that they are closer to parallel, which helps to scoop food (like rice) from below. You'll also be able to pick up larger pieces of food (see photo #3 above). This is the correct way to hold chopsticks. Ultimately, however, if you can comfortably pick up food and bring it to your mouth, you are effectively using chopsticks. Alternatively, you can grip the lower stick (from photo #1) with the tip of the ring finger but resting on the pinky nail bed. Then your thumb will lock this stick into place. The upper stick will move up and down to grip the food. 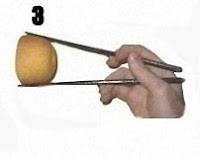 Another alternative is to grip the two chopsticks together like a pencil, then use the top fingers to push the sticks into a criss-cross position (and back again) to pick up your food. Take the chopsticks home to practice using them. Follow the steps above and lift a peanut, a pen, or a piece of fish. Try eating dinner with them. Floppy and/or sliced foods like cold cuts or sliced cheeses are good to practice on. They're more forgiving than cubed foods while you're learning to keep the chopsticks lined up and how much pressure to apply. Apply a firm but gentle pressure on the food, just enough to keep the food from falling from the chopsticks. Too much pressure is more likely to cause your chopsticks to cross at the narrow ends unless they're perfectly aligned and could launch your food across the table. Wood or bamboo chopsticks are the easiest to use because of the gripping texture at the tip. Plastic ones will be harder to use. Metal chopsticks, as favored by the Koreans, are the hardest of all. Master one, and move up to the next. The next time you go out, your hosts will be impressed! 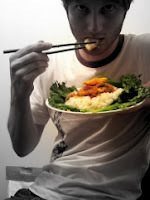 When getting food out of a bowl used by others, use the larger ends of the chopsticks. This keeps germs from your mouth, which would be on the smaller ends, from getting into the rest of the food. When you lose control over anger about not being able to do it, stabbing the food onto the chopstick may help. Avoid sticking your chopsticks into your rice straight down. It's bad manners, because it resembles the incense that family members burn to mourn a dead relative. It also resembles the manner in which rice is symbolically offered to the dead in Japan and China. When you are finished, put the chopsticks over the bowl and lay them flat. Avoid passing food with chopsticks. As in the previous warning, this resembles a section of the traditional Japanese funeral, where the family members pass bones using chopsticks. Instead, when passing food, place the food on an intermediary plate, preferably using a serving utensil or, if none is provided, turn your chopsticks around so the ends that have not been in your mouth touch the food, then give the plate to whomever. Do not cross your chopsticks. In Chinese cultures, this is a symbol for death. Always lay them parallel to each other.